This post has been read 675 times! February 25, 2018- The NYT reports, “To tally the donations that Mr. Cuomo has received from his appointees, The Times compared a New York State Authorities Budget Office database of hundreds of the governor’s nominations and appointments against the state’s campaign finance database. Both databases are public. Reporters then vetted the matches, searched for others and excluded authorities not covered by the executive order, like the Port Authority of New York & New Jersey, an interstate agency. Appointees named to their posts by previous governors and not reappointed by Mr. Cuomo also were excluded. The total also does not include donations raised at fund-raisers hosted by appointees, since they are difficult to track. The analysis identified about $890,000 in donations from 26 appointees. An additional roughly $830,000 came from family members, and $490,000 from firms owned or controlled by appointees. All told, 37 of Mr. Cuomo’s appointees have donated $2.2 million either directly or indirectly to the governor’s campaign since 2011. 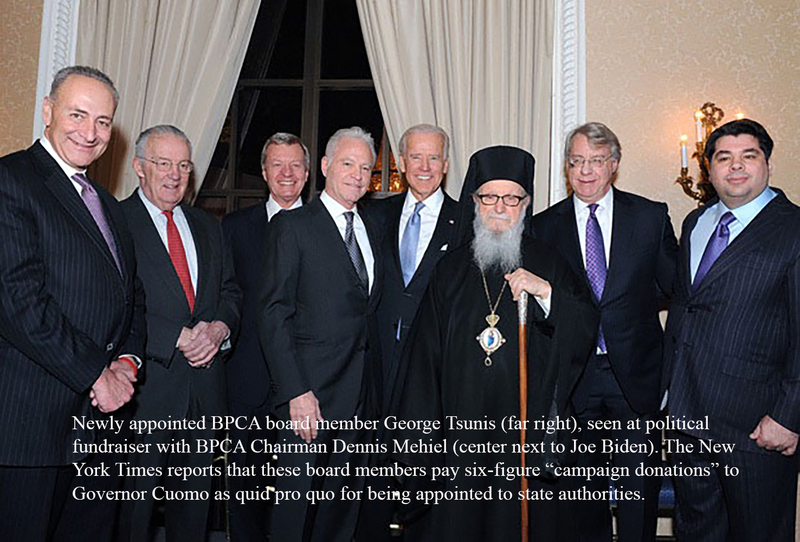 Perhaps nowhere are the connections of Mr. Cuomo’s appointees more apparent than on the board of the Battery Park City Authority, a public benefit corporation created to own and manage 92 acres of land in Lower Manhattan. The authority controls development and maintains the public spaces in the area, and can impose de facto taxes on residents. None of the seven board members live there; some have a history of large political donations. Take the chairman, Dennis Mehiel, for example. He built a fortune in the shipping container industry and was the Democratic nominee for lieutenant governor in 2002. He donated $92,000 to Mr. Cuomo’s campaigns before being appointed to the authority in June 2012, government records show. Less than a month after he was confirmed to the job, his wife, Karen, gave $20,000 to the governor’s campaign account. She has given $105,000 more in the years since, while Mr. Mehiel himself has contributed $10,000, and companies associated with him have kicked in an additional $35,000. Another board member, Lester Petracca, the president of a construction firm, has given $85,000 to Mr. Cuomo’s campaigns since being confirmed in June 2013, records show. His wife, Tracy, contributed $105,000. In all, four men have been on the Battery Park City board at least a year; three have donated personally or through their companies during their tenures. This entry was posted in - Downtown oversight, - Politics, - State Government, -- In the News, Battery Park City and BPCA, Political Essays. Bookmark the permalink. Joe Biden in the photo is spot on. Another corrupt politician. Hope you take them all down!